The public is of two minds when it comes to trade with other countries. Most Americans say that increased trade with Canada, Japan and European Union countries – as well as India, Brazil and Mexico – would be good for the United States. But reactions are mixed to increased trade with South Korea and China. 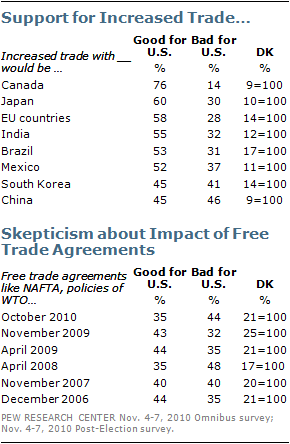 More generally, there is increased skepticism about the impact of trade agreements such as NAFTA and the policies of the World Trade Organization.Roughly a third (35%) say that free trade agreements have been good for the United States, while 44% say they have been bad for the U.S.
For instance, while Republicans and Democrats have about the same view of increased trade with China, there are wide age and educational differences. By 56% to 37%, those under 30 say that more trade with China is good for the U.S. Those 30- 49 and 50- 64 are divided, but more of those 65 and older see increased trade with China as bad for the country rather than good (52% to 37%). More than half (55%) say that free trade agreements lead to job losses in the United States, compared with just 8% who say these agreements create jobs; 24% say they make no difference. 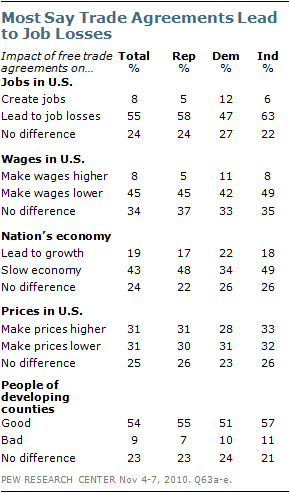 And while 45% say free trade agreements make wages lower, far fewer (8%) say they make wages higher. Similarly, the public does not see much benefit from free trade agreements for the overall economy – 43% say they slow the economy down while fewer than half as many (19%) say they make the economy grow. 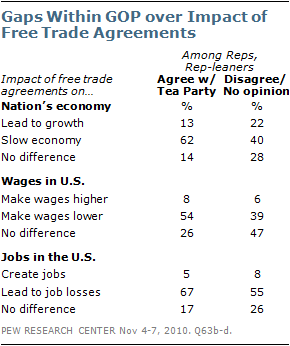 There also are differences among Republicans over the impact of free trade agreements on economic growth, and wages and jobs in the U.S. 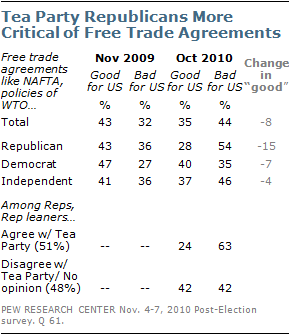 Fully 62% of Republicans and Republican-leaning independents who agree with the Tea Party say free trade agreements lead to slower growth in the U.S. That compares with 40% of Republicans and Republican leaners who either have no opinion of the Tea Party or disagree with the Tea Party. 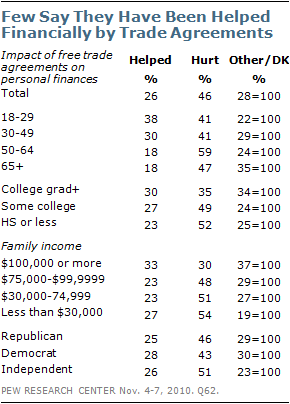 Nearly half (46%) of the public says they think free trade agreements have had a negative effect on their personal finances, 26% say they have helped, while 28% volunteer that they have neither hurt nor helped, they are not affected, or say they do not know. 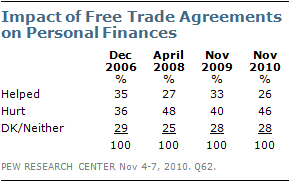 These views have changed little since 2008, but in December 2006, somewhat more (35%) said that free trade agreements helped their personal finances.